This time of year, after traveling 92.96 million miles, light from the sun pours over the earth and brings us long summer days in the Northern Hemisphere. For some people, it also brings out their freckles—those flat, brownish marks on the skin that are about 1-2 millimeters in diameter. These little spots tend to run in families, which suggests that freckles can be inherited. But which is it? Do they come from the sun, or from our genetics? To understand how freckles come to be, it helps to know about the MC1R gene. Though we often overlook it, the skin is our largest organ and serves a critical role in protecting us from environmental threats, including sunlight. Aside from visible light, sunlight also brings high-energy ultraviolet (UV) waves that can do significant damage to our DNA. Fortunately, we’ve evolved a kind of biochemical shield in the form of skin pigmentation. Spread throughout the skin are specialized cells known as melanocytes which are responsible for producing and distributing a colorful brown pigment called eumelanin. Melanocytes form an interconnected network with other cells in your skin and pump eumelanin between them. In this way, the small number of melanocytes in your skin are still able to form a mostly even layer of pigmentation that is capable of absorbing the harmful UV light before it reaches our DNA2. As people experience elevated levels of UV light, perhaps from a particularly sunny day, melanocytes are prompted to increase their defenses by producing more brown pigment—thus making the person tanner. In the process of doing this, the body calls upon the Melanocortin-1 Receptor gene (or MC1R for short)2. MC1R is a gene that codes for the MC1R protein (it’s common practice in genetics to give a gene and its protein product the same name). The MC1R protein helps cells communicate by sitting at the surface of a cell and detecting specific signals from neighboring cells. If triggered, the MC1R gene initiates a cascade of events within a cell that ultimately increases production of eumelanin. In response to UV light, cells in the skin begin to release signals that are detected by the MC1R protein in melanocytes and prompts increased coloration of the skin1,2. You might recognize the MC1R gene for its role in producing red or blonde hair. This happens when someone inherits at least one variant in the MC1R gene that causes it to be less effective. As a result, cells contributing to hair coloration are prompted to produce pheomelanin instead of eumelanin, which results in red pigmentation. In the skin, MC1R variants are associated with fair complexion as a result of reduced brown pigment production. Curiously, variants in MC1R are also associated with increased likelihood of freckling1,2. Typically, when people refer to freckles, they’re talking about a specific type of freckles known as ephelides. Characteristically, ephelides get darker in the summer months, likely as a result of increased sun exposure. Research into the biology of freckling has shown that the concentrated color change is a result of increased melanocytes and an elevated production of eumelanin relative to the surrounding skin. However, scientists don’t yet understand why the freckles form in such a concentrated space and why those melanocytes are behaving differently compared to the others. 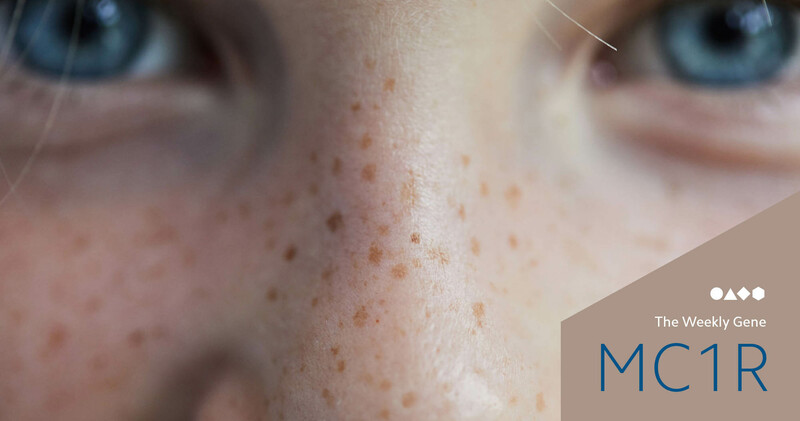 Scientists have identified and analyzed more than 80 variants in the MC1R gene, some of which are strongly associated with freckle formation in people from various ethnicities. There are also many other genes that could contribute to freckle formation1. Decades of research have shown that ephelides are a heritable trait and that genes like MC1R have a big role to play in this—however, the amount of color in those freckles may be influenced by a combination of genetics and environment. While it’s clear that researchers still have a lot of work to do on figuring out freckles, you can do some snooping of your own. DNA tests are available that help you explore your DNA and learn about how it may be influencing your traits. DNAPassport from HumanCode will help you understand if your freckles might be the result of genetics, and Neanderthal from Insitome lets you see if your MC1R gene is a relic from our Neanderthal ancestors. 1Praetorius, Christian, et al. “Sun-Induced Freckling: Ephelides and Solar Lentigines.” Pigment Cell & Melanoma Research, vol. 27, no. 3, Mar. 2014, pp. 339–350., doi:10.1111/pcmr.12232. 2Maddodi, Nityanand, Ashika Jayanthy, and Vijayasaradhi Setaluri. “Shining Light on Skin Pigmentation: The Darker and the Brighter Side of Effects of UV Radiation.” Photochemistry and photobiology 88.5 (2012): 1075–1082. PMC. Web. 13 June 2018.